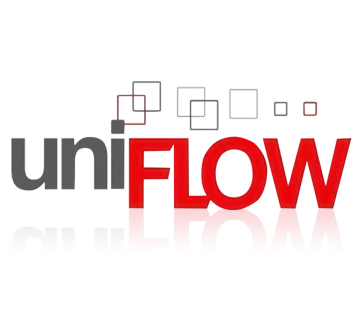 uniFLOW is a software platform designed to bring the full value of multi-functional devices to the organisation. The modular structure of uniFLOW and the tight integration with Canon hardware allows the system to be built depending on the organisation’s exact requirements. All printing and copying, together with the associated costs can be tracked and stored. The built in reporting system allows the administrator or finance department to see and control how much each printer and user is costing the company. Confidential jobs can be held centrally on a print server and are only released when the user authenticates at the device. The user can go to any device in any location with the knowledge that their job will be printed securely. Thus, eliminating environmental and financial waste. Secure printing feature for embedded uniFLOW devices, single function printers and 3rd party devices are also supported now. uniFLOW can intelligently route print jobs to the next available printer in the event that the original and preferred printer breaks down. Print jobs can also be automatically routed to the most cost-efficient devices within the office (e.g. colour print jobs from desktop devices to larger multi-functional printers). With Canon Universal Driver, this task is made easier as there will only be single driver in the environment. According to a recent study, paper records were the second most significant source of a data breach, second only to losing a laptop or other data device. uniFLOW handles the issue by using the Secure Audit Module to monitor all activities done on the MFD and all jobs are searchable by administrator / auditor to trace the leakage. This measure in place will deter any future attempts to leak confidential documents out of organization premises. Users can submit confidential jobs from any mobile devices which are then held centrally on a print server. Jobs can be viewed and released directly from their mobile devices for printing. Dedicated applet is also available now in Apple® Store for users who are using the iPhone or iPad. This instantly enables total mobility for the users to print or release their jobs without a need to have a networked PC or at an exact print location. Using paper and the information contained on it remains a critical part of every user's daily work. uniFLOW allows users to scan documents directly to their email accounts, network folders or document management systems such as Microsoft® SharePoint® & Therefore™ in the form of highly compressed image files. With uniFLOW graphical workflow editor, administrator can decide exactly what should happen when users print or scan a document be it archiving a document or OCR and capture information from the document.